The random variable the number of occurrences in the interval of interest. Let the number of loaves of bread put on the shelf in five minutes. If the average number of loaves put on the shelf in 30 minutes (half-hour) is 12, then the average number of loaves put on the shelf in five minutes is loaves of bread. The probability question asks you to find . Read this as “X is a random variable with a Poisson distribution.” The parameter is (or ); (or ) the mean for the interval of interest. Leah’s answering machine receives about six telephone calls between 8 a.m. and 10 a.m. What is the probability that Leah receives more than one call in the next 15 minutes? If Leah receives, on the average, six telephone calls in two hours, and there are eight 15-minute intervals in two hours, then Leah receives calls in 15 minutes, on average. So, for this problem. Note: The TI calculators use (lambda) for the mean. The y-axis contains the probability of x where the number of calls in 15 minutes. According to Baydin, an email management company, an email user gets, on average, 147 emails per day. Let the number of emails an email user receives per day. The discrete random variable X takes on the values 0, 1, 2 …. 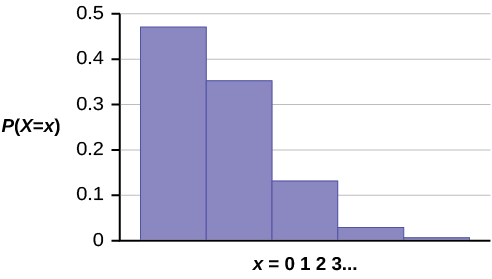 The random variable X has a Poisson distribution: . The mean is 147 emails. A Poisson probability distribution of a discrete random variable gives the probability of a number of events occurring in a fixed interval of time or space, if these events happen at a known average rate and independently of the time since the last event. The Poisson distribution may be used to approximate the binomial, if the probability of success is “small” (less than or equal to 0.05) and the number of trials is “large” (greater than or equal to 20). means that X has a Poisson probability distribution where the number of occurrences in the interval of interest. The variance is , and the standard deviation is . When P(μ) is used to approximate a binomial distribution, where n represents the number of independent trials and p represents the probability of success in a single trial.